Erica Key of the blog Eating With Erica, who made her first appearance on the Love, Reese blog with some mouthwatering pimento cheese pigs in a blanket for football season, is back with another seasonal recipe you’ll fall in love with. When the weather temperatures drop, we firmly believe the temperature of your drink should go up. Who doesn’t like to snuggle up in a Draper James sweater and a warm, frothy drink? 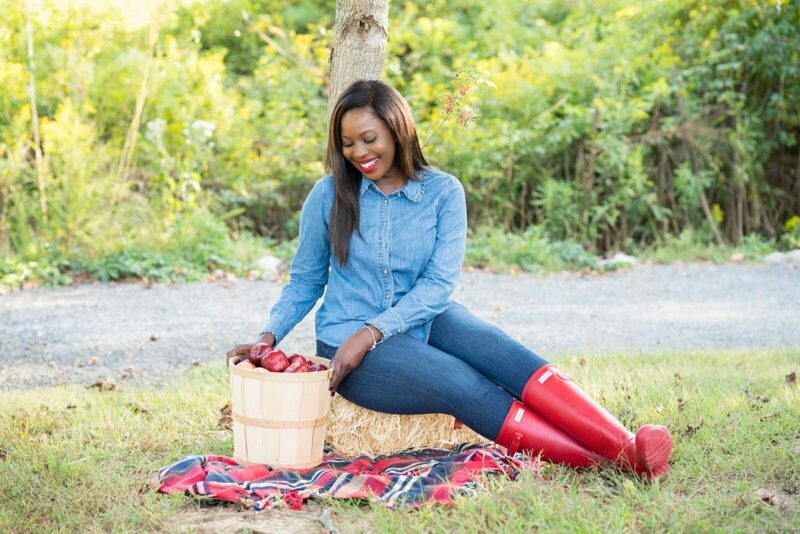 Erica’s Hot Apple Cider recipe is our hot drink of choice this October; we know y’all will love it, too! 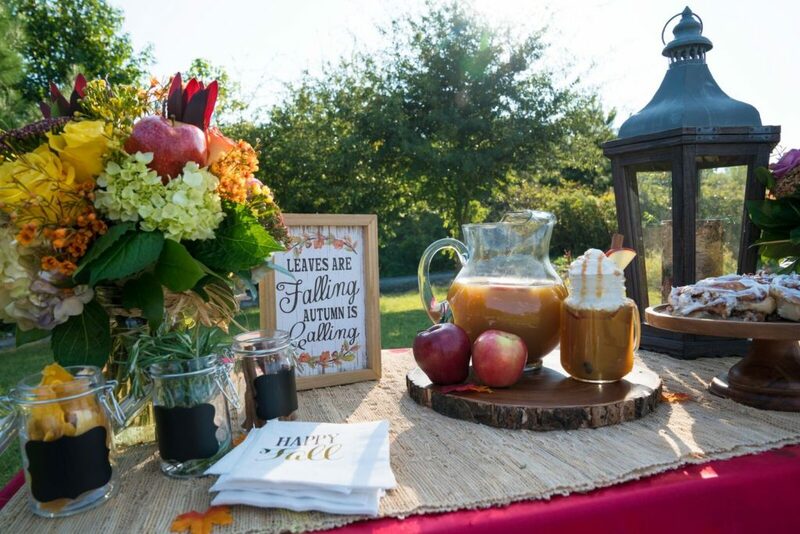 Tell us about this Hot Apple Cider recipe. 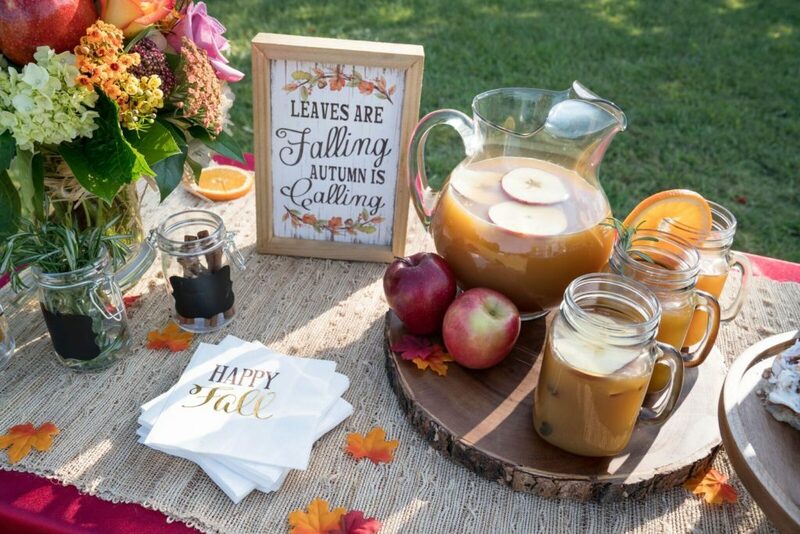 I can’t think about fall without thinking about apple cider. They go together like mac and cheese, PB&J, and shrimp and grits. What I like about this recipe is that you have two ways to make it. For the woman on the go, you can purchase it. With a bit more time, you can make this in a slow cooker. Both methods to make apple cider have crowd-favorite results. 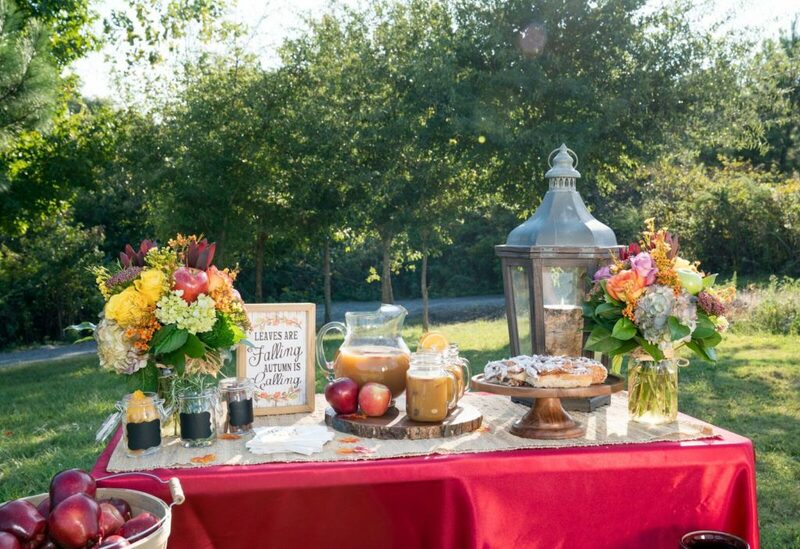 If you are entertaining, you can create an apple cider bar with a variety of tasty toppings such as rosemary, dried fruit, and whipped cream. If your guests prefer their apple cider spiked, bourbon is a great option. What drew you to the Draper James Lexington Chambray Button Down? I love denim on denim, especially in fall. It’s perfect for a casual chic look. It is a very easy shirt to layer with a vest or sweater, which means you can go causal or you can dress it up. I especially love the small ribbon detail on the cuffs. 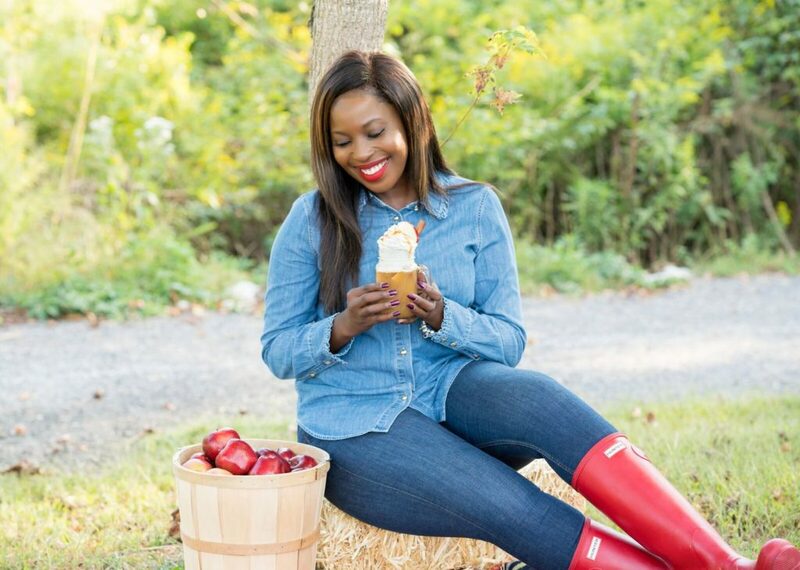 What’s your favorite fall activity (apple picking, going to a pumpkin patch, baking, etc.)? Wine tours are the best around Atlanta in the fall. There is beautiful scenery with mountains in the background. My friends and I love to go from one to another in North Georgia. Do you have anything fun planned for this fall? Every year I host a Friendsgiving with all of my close personal friends. It is an event that everyone looks forward to. It’s filled with wine, laughter, and gratitude. My friends are my second family, and fall is the perfect time of year to celebrate. Add the apple cider to your slow cooker, and whisk in 1/3 cup of brown sugar. Place the cinnamon sticks, orange peel, cloves, and allspice onto a square of clean cheesecloth and tie to form a secure pouch, and place in the slow cooker. Heat on Low for 2-3 hours, taste, and add more brown sugar if desired. Once the cider is your preferred temperature, set slow cooker to Warm. Note: If you’d prefer to cook this on a stove top, bring to a boil, and reduce to a simmer, covered for around 30 minutes. Transfer to slow cooker to keep warm. Yum!! Will definitely be making this. Adore this recipe and her DJ denim- so cute! I’m totally obsessed with Erica and all of her recipes, I constantly call her for date night ideas and I’m sure this cider is no short of delicious! This post gave me the warmest fall fuzzy feelings! That Draper James chambray button down and the delicious apple cider recipe are the perfect combination for this time of year. Omg I love this! Totally going to try this recipe and might I say these pics are flawless? Love! I love everything about this! Erica is always an inspiration for recipes, fashion, and being overall fabulous–can’t wait to check out the Draper James store when I’m in Nashville next week! this looks awesome! Getting ready for my Halloween party!! Love this post so much! Erica is so beautiful!!!!!! I can’t wait to go apple picking this fall with my gal pals! This cider recipe sounds soooo good. I can’t wait to try this for the holiday season. The spread looks amazing as well!! Feeling a lot like fall.